This entry was posted in Baby Teeth, Oral Care and tagged ankyloglossia, baby, natal tooth, neonatal teeth on April 17, 2012 by SH. WHAT ARE NEONATAL AND NATAL TEETH? This entry was posted in Baby Teeth, Oral Care and tagged baby teeth, deciduous tooth, natal tooth, neonatal teeth, Neonatal tooth on April 6, 2012 by SH. This entry was posted in Baby Teeth and tagged deciduous dentition, delayed eruption of teeth, dental arches, extraction, neoplasm, orthodontic traction, physical obstruction, root development, soft tissue barrier, tooth position on February 11, 2012 by chzechze. This entry was posted in Baby Teeth and tagged bone density, congnital absence, delayed eruption of teeth, dental arch, ectopic development, embryonic fusion lines, herediatary syndrome, maxilalry canine, permanent tooth agenesis, tooth germ on February 10, 2012 by chzechze. This entry was posted in Baby Teeth and tagged bony tissue barrier, deciduous incisor, delayed eruption of teeth, dilaceration, gingival hyperplasia, mandibular growth, mucosal barrier, permanent germ, succedaneous tooth on February 7, 2012 by chzechze. Did you ever wonder why do you find some children with a small extra tooth in between their permanent incisors? This small little tooth is called Supernumerary Tooth. A Supernumerary Tooth is one that is additional to the normal series and can be found in almost any region of the dental arch. Most supernumerary teeth are located in the upper incisors region commonly known as mesiodens. Their presence may give rise to a variety of clinical problems in the future for children. 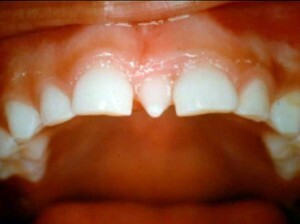 This entry was posted in Baby Teeth, Braces, Orthodontic and tagged conical supernumerary teeth, diastema, hyperactivity theory of dental lamina, impacted supernumerary teeth, mesioden, multiple supernumeraries, odontome, orthodontic treatment, paramolar, parapremolar, Permanent dentition, primary teeth, supernumerary teeth on February 6, 2012 by joann. This entry was posted in Baby Teeth and tagged defective mineralization, delayed eruption of teeth, embedded teeth, eruption process, eruptive force, ghost teeth, nonankylosed, obstruction, odontoma, root formation on February 6, 2012 by chzechze.